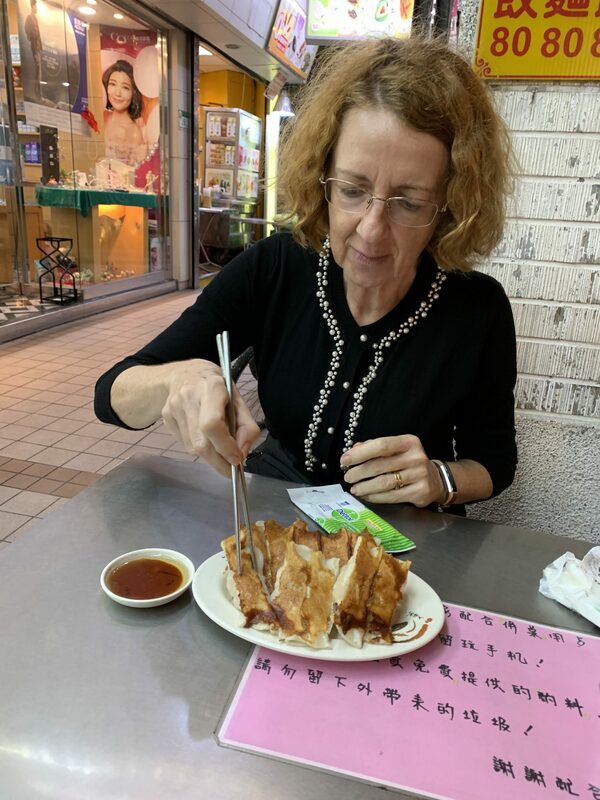 So when I arrived in Taipei, getting to grips with the local food was my number one priority. 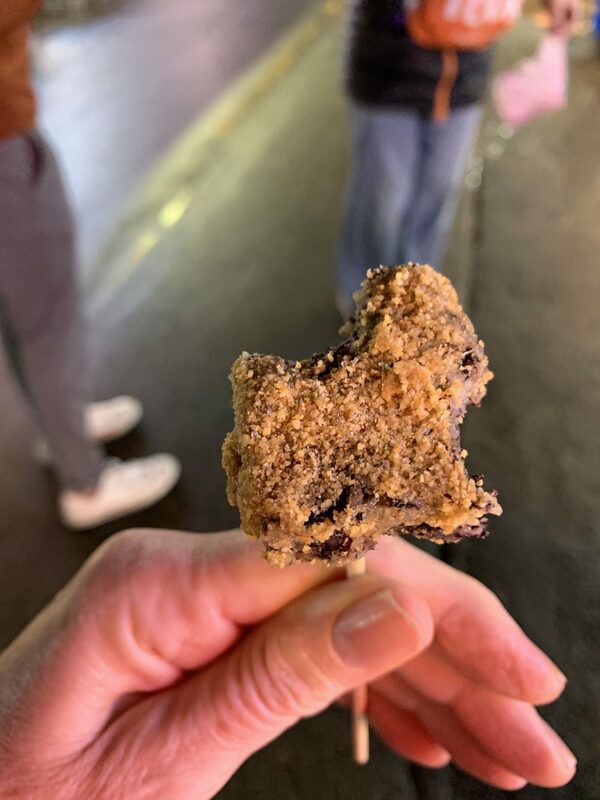 I really like walking food tours, where the tour guide walks you around an area of the city and talks about the history, the culture and the food – and takes you to some great eateries. It then gives you enough of an understanding to be able to strike out on your own afterwards. took me around the stalls and explained what everything was. She then let me try whatever I fancied, with a few recommendations thrown in. 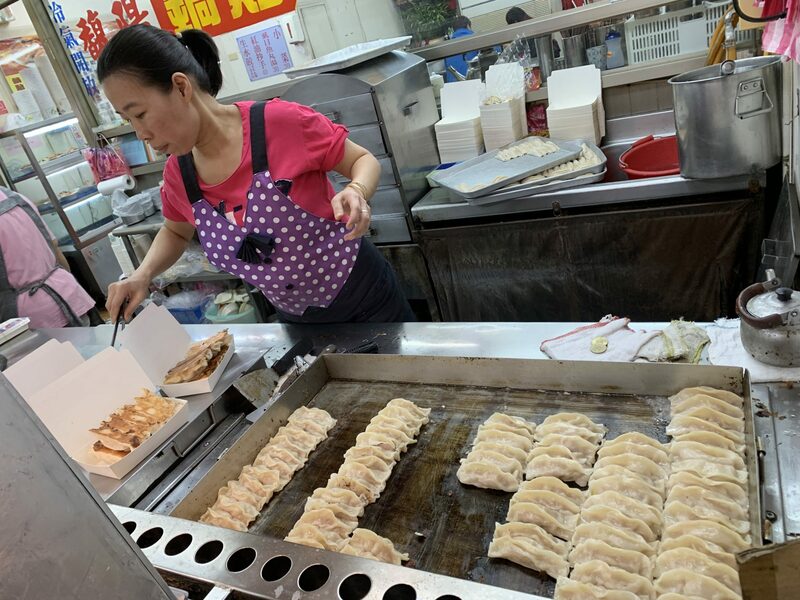 The stallholder makes about a million a day, I should think, and as they only serve one thing, they’re pretty good at making it. – I didn’t think it would be very substantial. 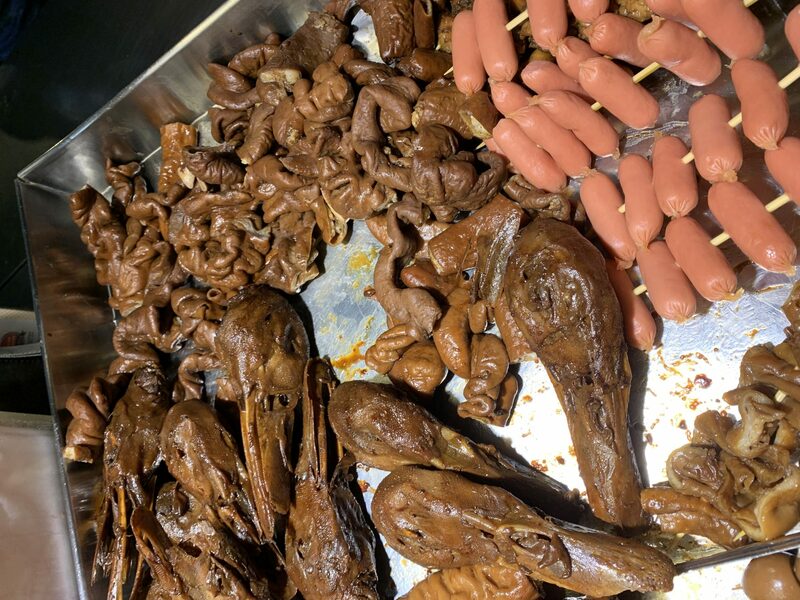 Then we moved on to the intestines in the picture below, and the ones on the left, wrapped up like a pair of earphones, were quite nice. 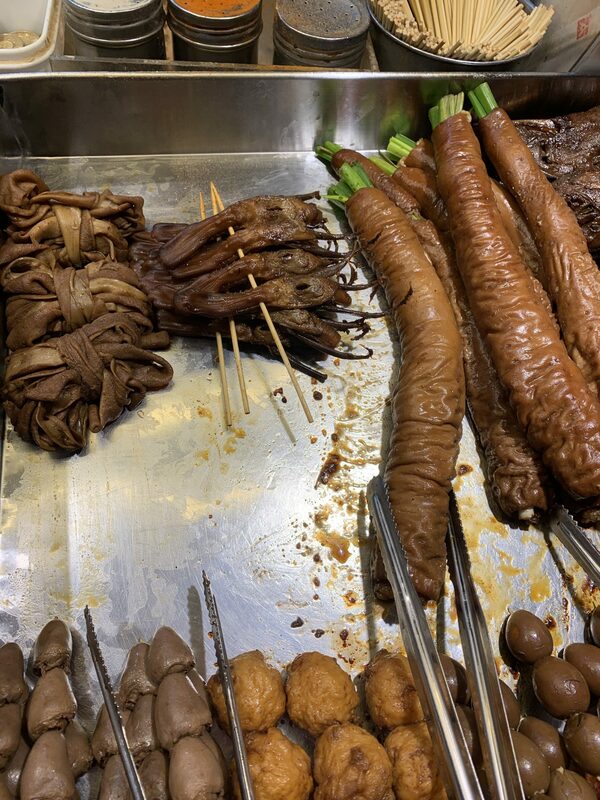 These are the small intestines – the large intestines are on the right, stuffed with spring onions which makes them look like wrinkled brown carrots. I was dubious at first, but actually liked it when I tried it. 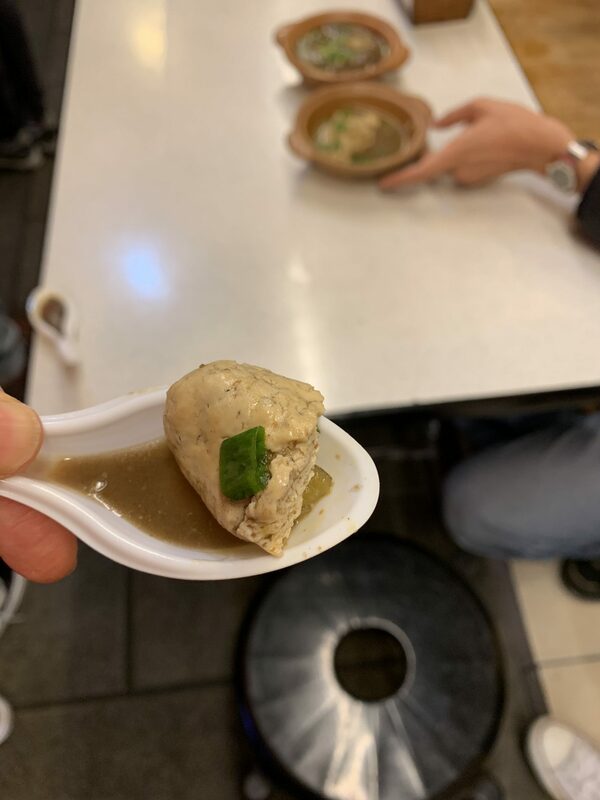 No, I wasn’t sure about the coriander, either – but somehow it works! 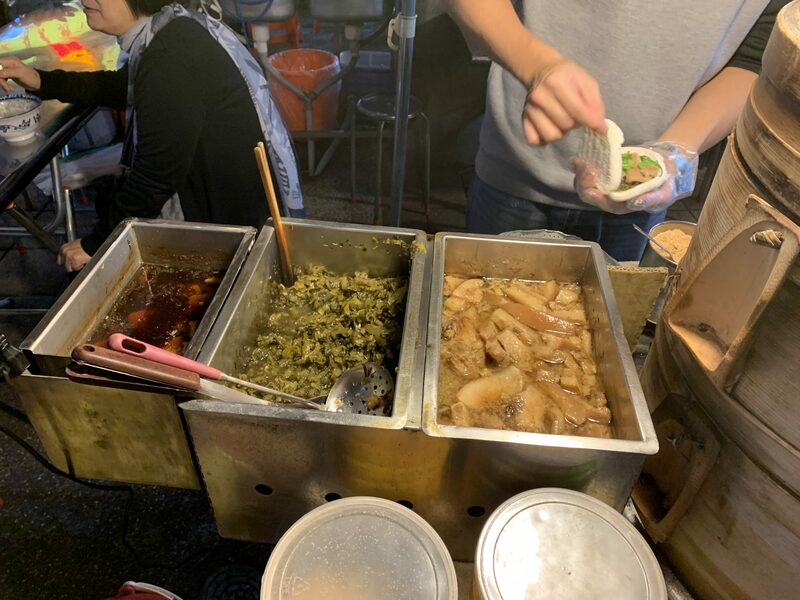 One useful tip I was given – if you see a long queue at a stall, join it, because whatever they’re selling is going to be good. 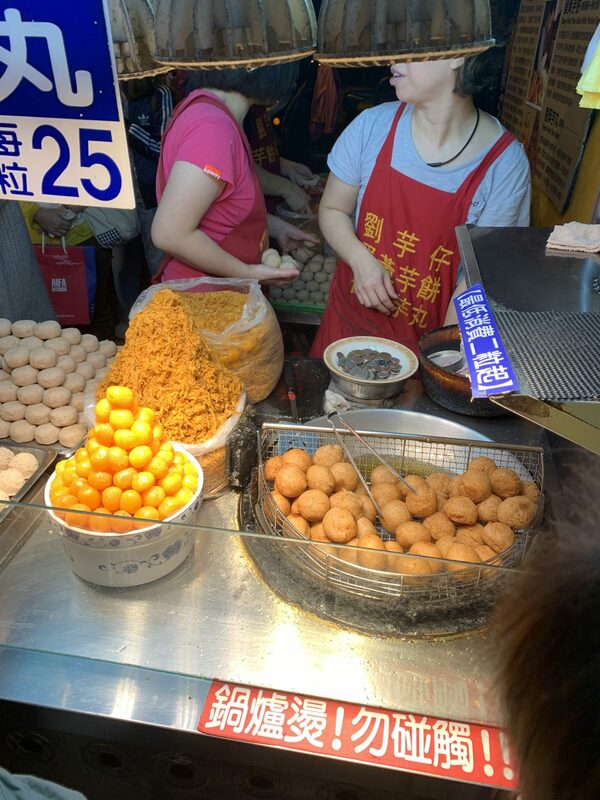 There was a huge queue at this stall for their fried taro balls, which were hot and crispy on the outside and fluffy in the middle. 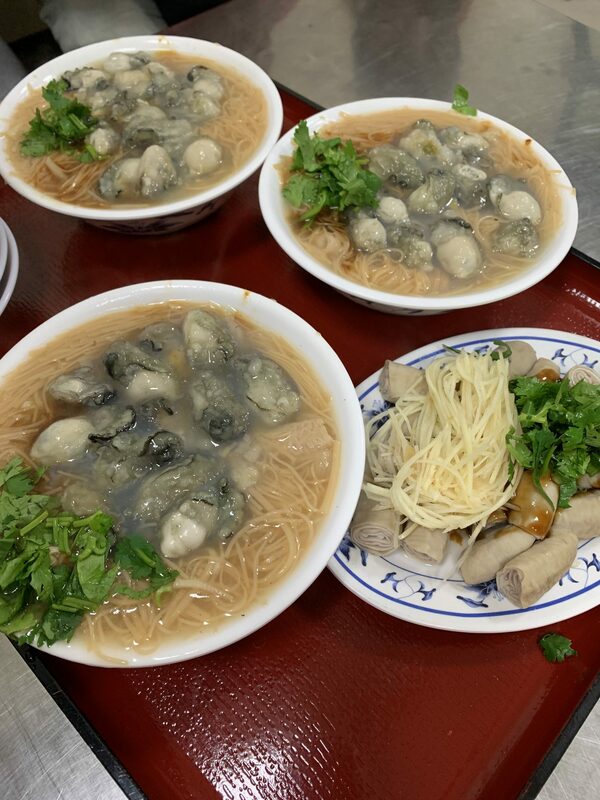 I’m now a confirmed taro fan. 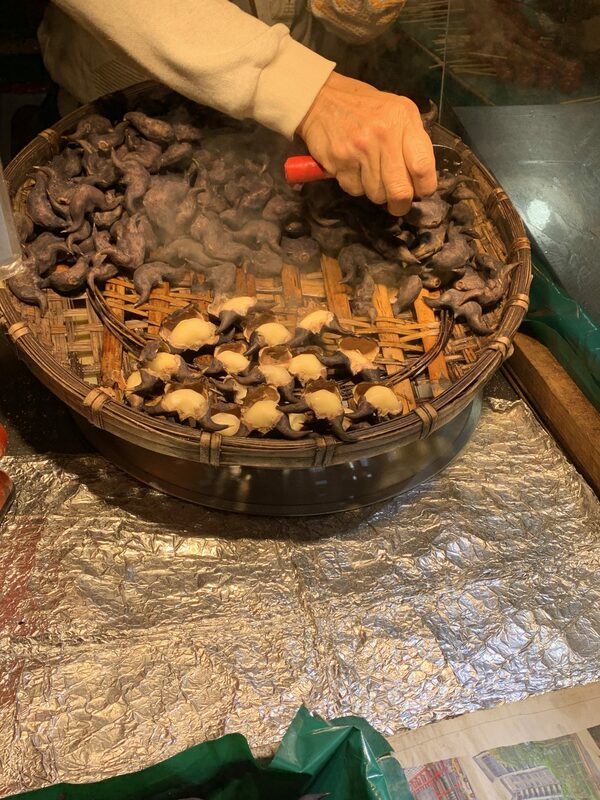 – that the stallholder is painstakingly peeling one by one. I’d never seen a fresh one before, only the tinned ones that were the height of adventurous eating in England in the 1970s. Then I tried a steamed bun stuffed with pork and pickled vegetables, which was divine. 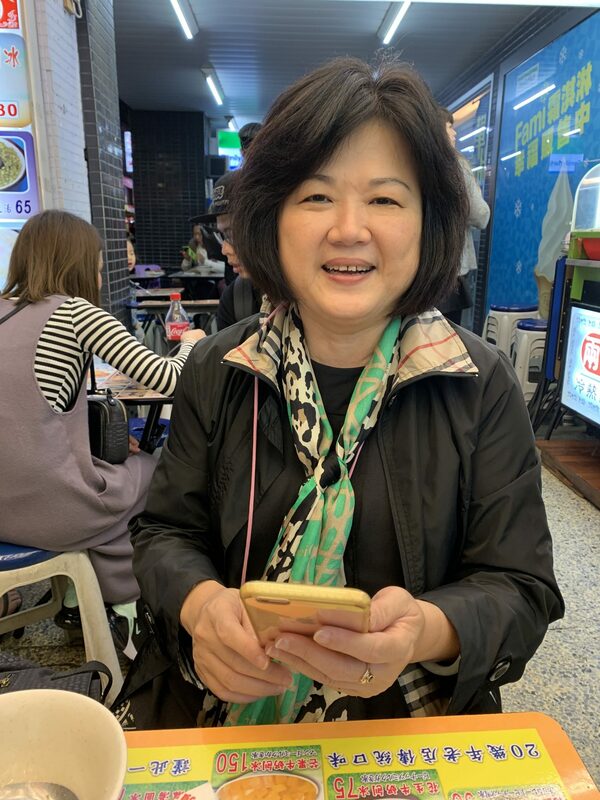 I realised that I’d gone from a pork-free country to a pork-obsessed one, and Joanna told me that Taiwanese pork is highly prized because they castrate the male pigs, which makes them taste better. So I shall be passing this advice on to any pig farmers I meet in the future. 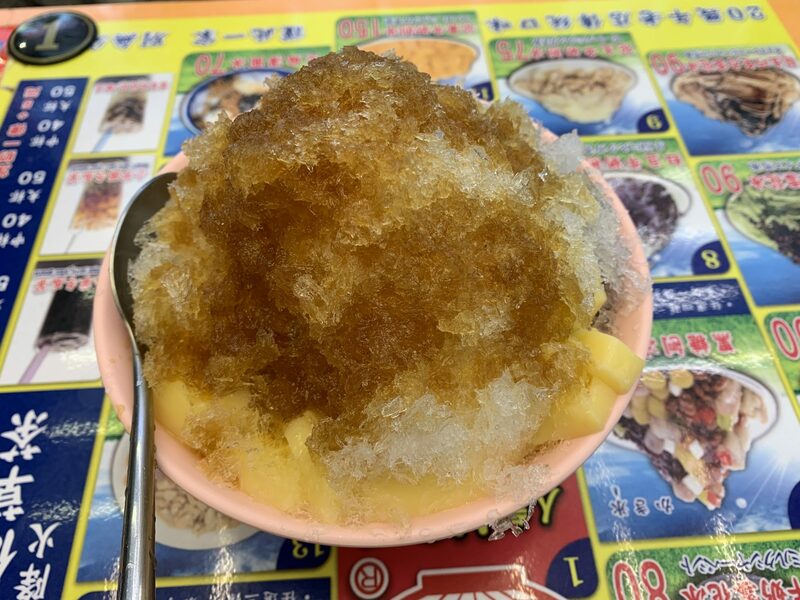 but it wasn’t nearly as good as Malaysian cendol. 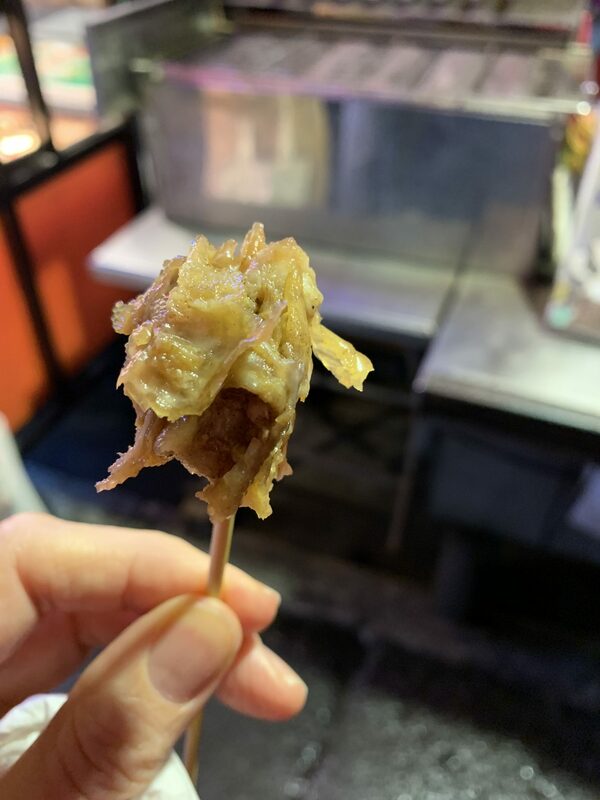 Emboldened by my experience, I signed up for another food tour – this time at a very local night market – where I got to try the most famous Taiwanese dish … stinky tofu. They’re very proud of it, in much the same way as Malaysians are proud of their stinky speciality, durian. Level 3, definitely PhD level, is boiled. 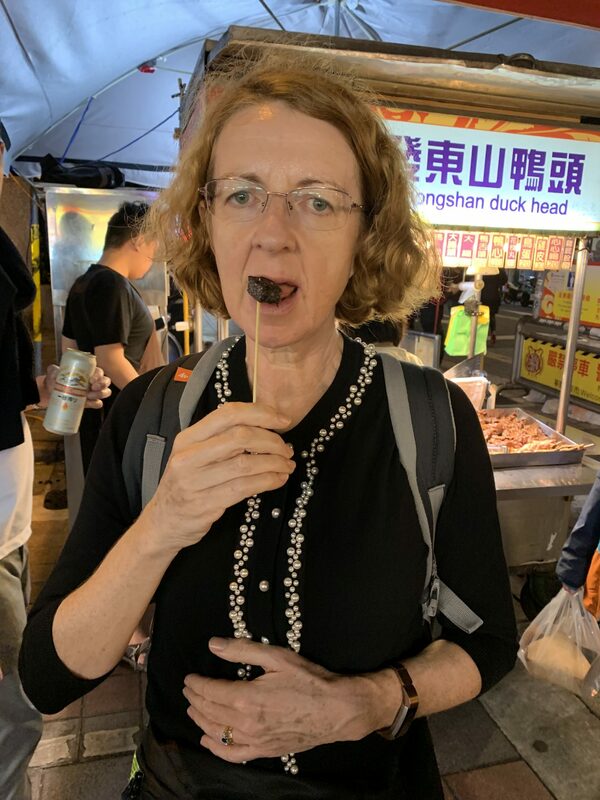 Unlike pigs’ blood, which is chewy and savoury, duck blood is gelatinous and slimy, and was the one thing I didn’t enjoy eating on the food tours. 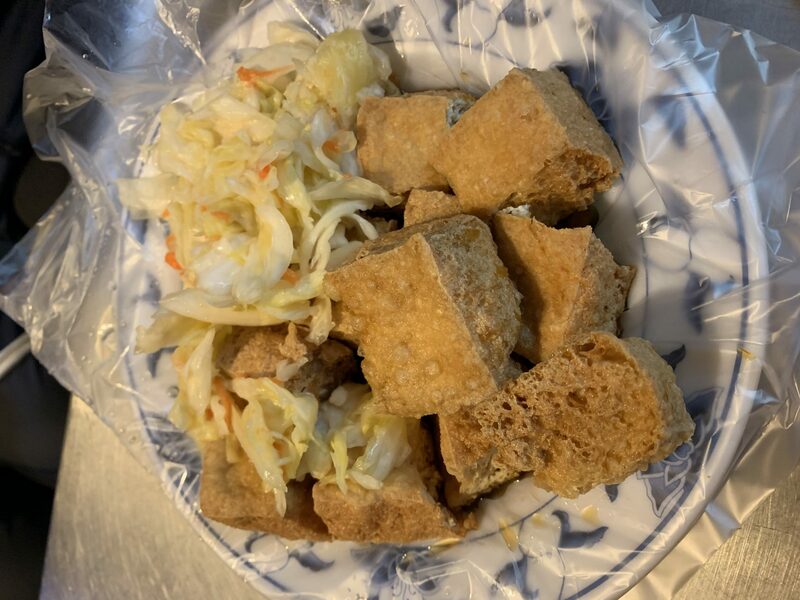 Stinky tofu is pungent and lingering, and is often compared to blue cheese. 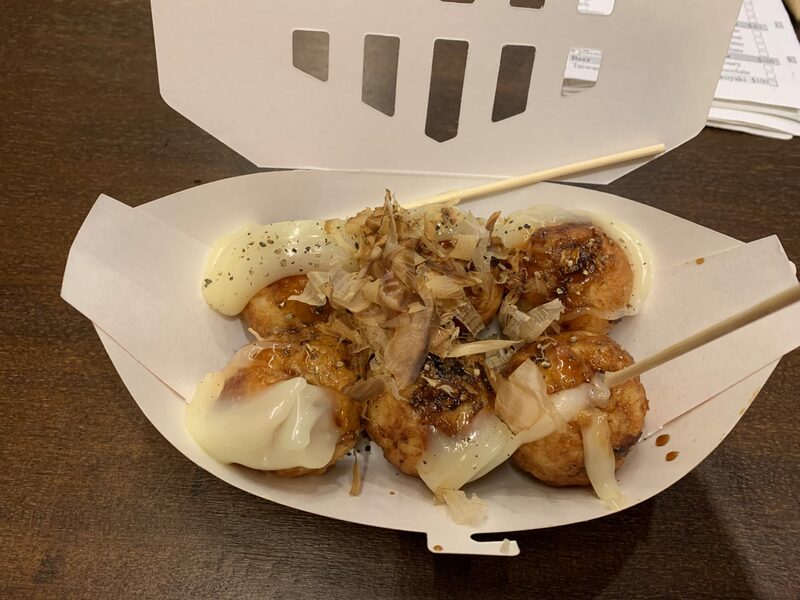 So, if you like a bit of Stilton, you won’t be fazed by even Level 3 stinky tofu. 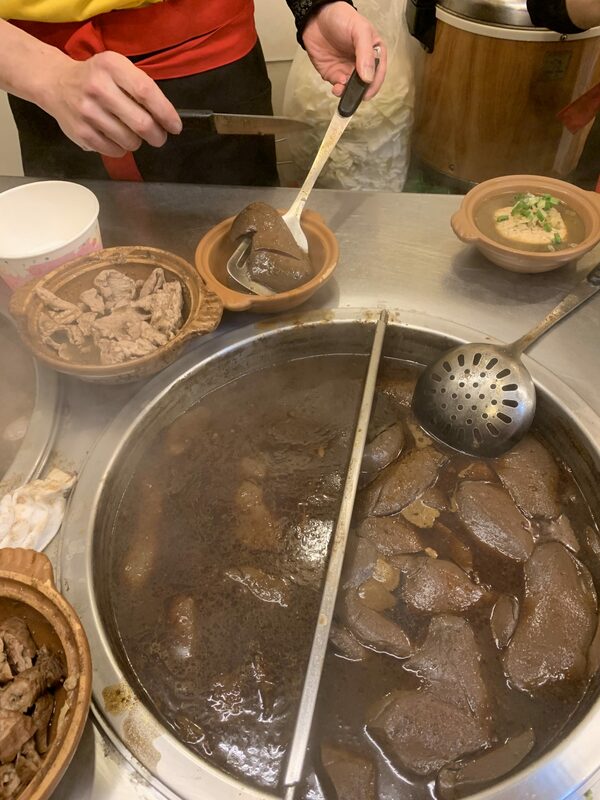 Do you know what they use to clean intestines ready to eat? What does it do to our intestines when we drink it? What did they use before Coke was invented? 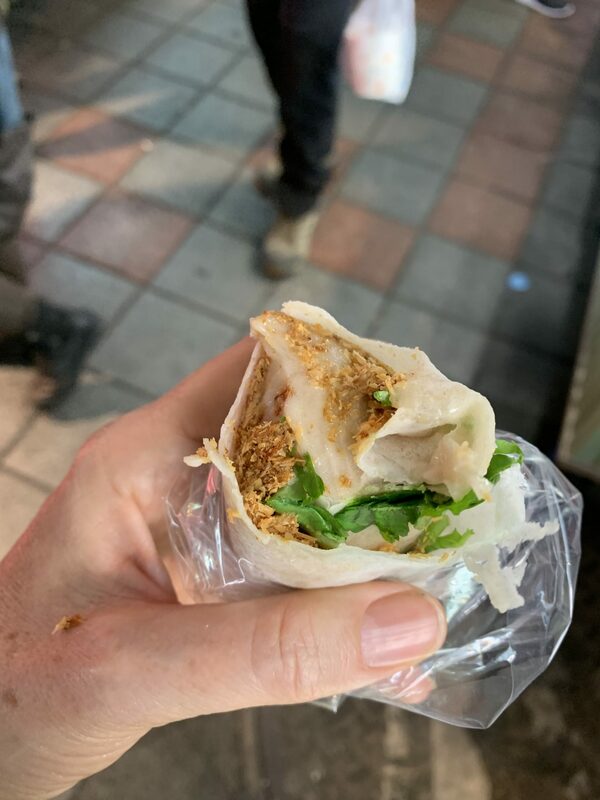 crunchy and chewy and served with mayonnaise and some flaky stuff that looked like onion skin, but tasted of nothing. 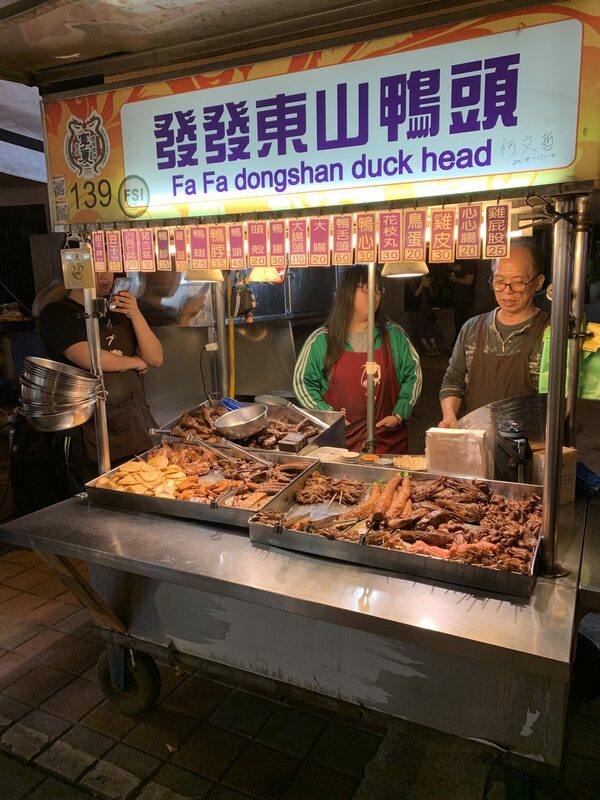 a bit gristly for me, but a very popular snack for the locals. 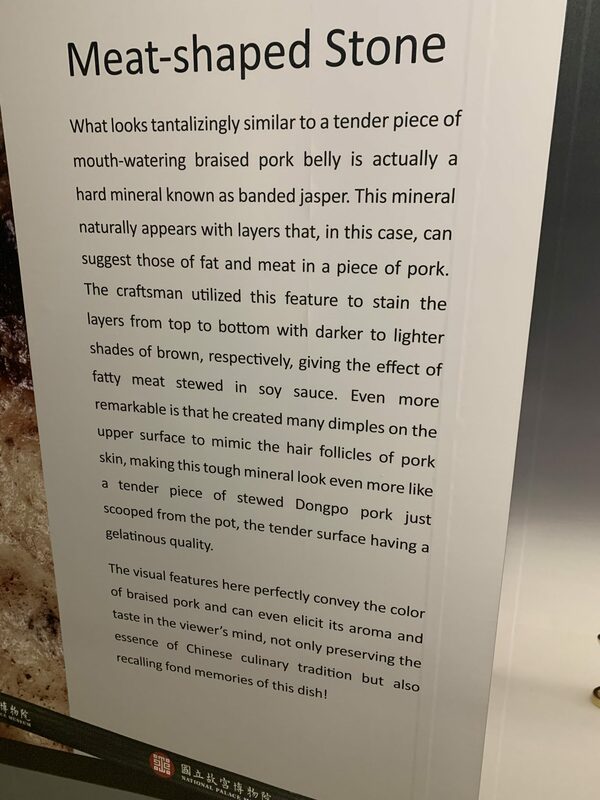 It’s a piece of banded jasper, lovingly crafted to look just like a piece of pork. 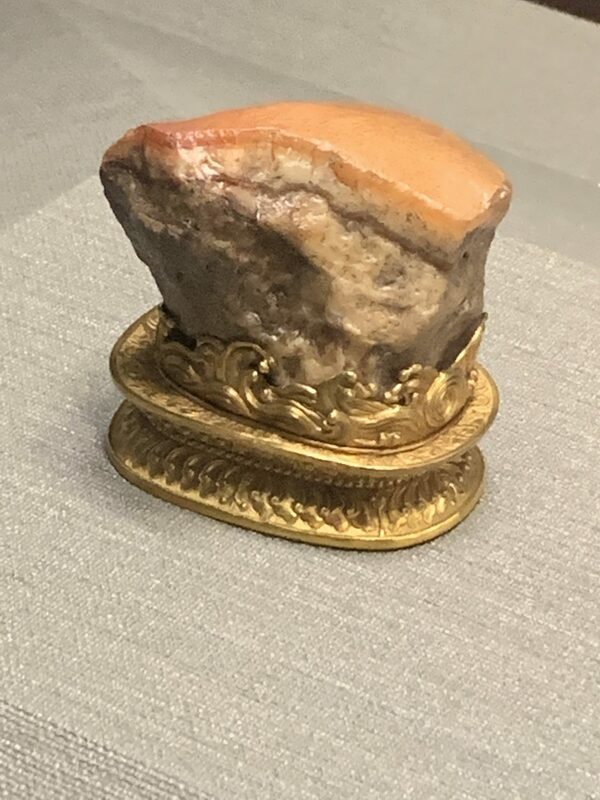 I think the British Museum should take note, and commission a stone shaped like a Yorkshire pudding, a Cornish pasty or – for a touch of colour – a slice of Battenberg cake.